Playing physical scratch cards from newsagencies and gas stations has its charms, but getting the best odds on winning is not one of them. The typical payback percentage (RTP) for traditional scratchies found in retail outlets is around 90%. Online scratchies however, give the player a payout percentage of approximately 96%. The higher the RTP the better so if you’re keen on chancing your money with some entertaining scratch cards, you’ll get much more value playing a large variety of instants on the Web as opposed to buying one a week at your local outlet. 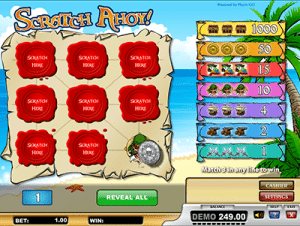 Online scratchies give you a more dynamic gaming experience than you can ever find with physical scratch cards. While you may lose the palpable joy of scratching off the latex paint covering on physical scratch cards, with online scratchies, you gain additional advantages. Online real money scratchies allow you to match stakes to themes: One of the great aspects of all scratchies, whether physical or online, is the variety of themes you can play with. From popular casino games like blackjack to sports activities and television shows, the themes on scratch cards range widely, but with physical cards, whatever stakes were printed on the card initially is what you get. 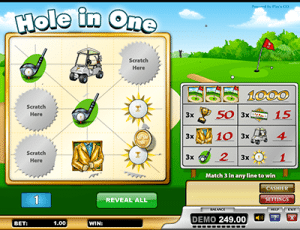 With online scratchies, you have the ability to pick a theme and set the stakes you want to play: If you tire of the theme, simply cash in and leave the online scratch card for another. You can set it to whatever stakes you prefer. Online real money scratchies offer convenient payout methods: When you go online, you may wind up playing online scratchies for real money at a casino under an entirely different national jurisdiction than your location, but most online casinos offer a wide variety of currencies to play with, and secure payment methods. Online real money scratchies allow you greater mobility: Not only do online scratchies allow you to play for real money like their physical counterparts, but they allow you to do so anytime and anywhere. All you need is a device – smartphone, tablet, laptop, or desktop – with a reliable, and preferably secure, Internet connection. Whether the physical or online versions, real money scratchies all work on a simple premise similar to how pokies work – match symbols according to the instructions on the scratch card and win. Hidden beneath a covering made of latex paint, typically, or electronic pixels, are the symbols you have to match. Some scratchies require you to pick specific parts to scratch off while leaving others alone and then match a certain number of symbols, for example scratch off four spots and match three might be the card’s requirement to be a winner. Other scratchies remove the guessing aspects. With these you can scratch off the entire card rather than only parts of it. Often scratchies post their frequency of winning on their cards, such as one in three cards win. This is different than the payout percentage, however, because you may win one in three times but the amount of that win will allow the payout percentage to play in the card manufacturer or the casino’s advantage over time. Online scratchies will often appear quite similar to their physical counterparts. With the click of your mouse, you uncover the symbols, or in the case of some touch screen programs, dragging a finger over that area of the screen even more accurately simulates the physical experience of a physical scratch card. With the sound and graphics capabilities they provide, many online scratchies have dispensed with the simulated card look altogether, and almost resemble video pokies in their look and feel, except that matching symbols throughout a grid wins in the case of online scratchies. Pokies still limit wins to symbols that line up according to a specific configuration. One of the best providers of scratch cards is Play’n Go found at House of Jack online casino. Regardless of where you go to enjoy scratchies, play for real money because the scratchies are games of luck and chance. Although you can find scratchies online for play money, you need not waste your luck when you can play scratchies online and win real money. Whether you use a credit card, debit card, e-Wallet, bank transfer, or another type of payment method, depositing money into your own specialised casino account is a simple process at most casinos. More importantly, getting your money out of your casino account and back into your hands is also a simple process, and in most cases, an instantaneous one. Since all of the web casinos listed in the table above offer 24 hour technical support, if you have any concerns regarding your payouts, you can get immediate help. Internet casinos now provide compatible software for most common operating systems for laptop computers, tablets, and smart phones. For those systems that are not compatible with the casinos’ software, the casinos also offer browser based, no download versions of their electronic scratchies. Online real money scratchies also provide special introductory bonuses. Before you pick a casino or website to play scratchies for real money, take a look at the sign up bonuses that these sites will offer. You can get free bonus money from these sites simply for opening an account and for playing their scratchies. We recommend Raging Bull Casino for a range of instant-play online scratch games, which accepts players from United States and offers a selection of safe deposit methods and bonus offers for real money players.